CPRA organized 'the Training Program for the Management of Performers' Rights 2018' from December 3 to 7. This is one of the main activities of CPRA International Team since 2010. 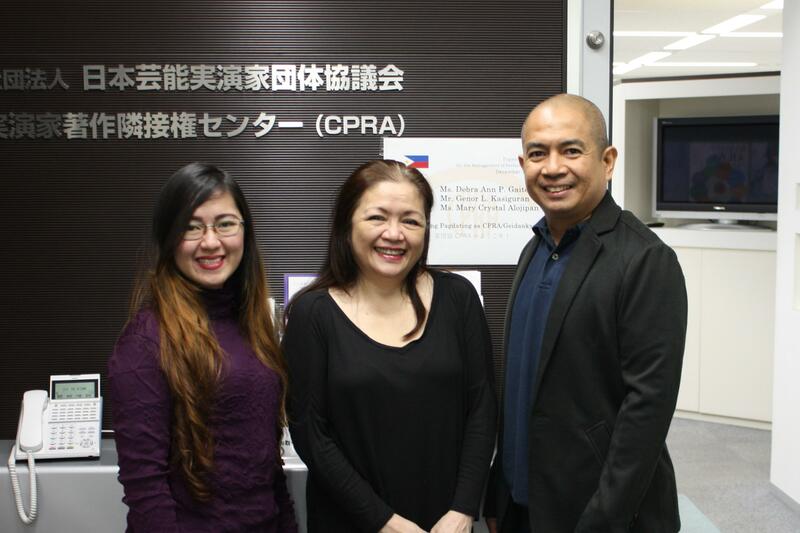 We invited three staffs, Ms. Debra Anne P. Gaite, General Manager, Mr. Genor L. Kasiguran, Distribution and Data Management Division, and Ms. Mary Crystal Alojipan, Membership Division from PRSP, the CMO in The Philippines this year. We provided the following sessions: CPRA/Geidankyo organization structure, Performers' Rights under Copyright Law of Japan, Negotiation and Collection, Membership Registration, Distribution to CPRA members, and Agreements with foreign CMOs for financial exchanges. The participants enthusiastically learned the establishment of database that enables the transparency in the distribution of royalties and the relationships with foreign CMOs including the membership of SCAPR. On the last day, we had a one-day bus tour visiting the foot of Mt. Fuji enjoying the Japanese cultural experiences and sightseeing. CPRA would like to actively continue to organize such training programs for supporting the Asian CMOs.